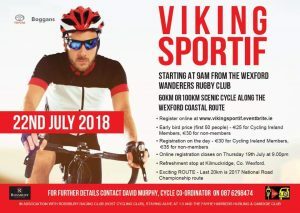 Leaving at 9.00am from the Aldi car park and heading to Clonroche. Then turning left at the Institute then onto New Ross, Dunganstown, climb Slieve Coillte, JFK Park. Returning home via New Ross, Ballinaboola and Wexford. Approx. 115km. Coffee stop in JFK Park. Short cut’s available if needed. The tour will leave Petitt’s car park at 9.00am heading for Caim, Killane, Rathnure, Ballywilliam, Borris or Graiguenamanagh for the coffee stop. Approx. 75km/80km. Shortcuts if needed. 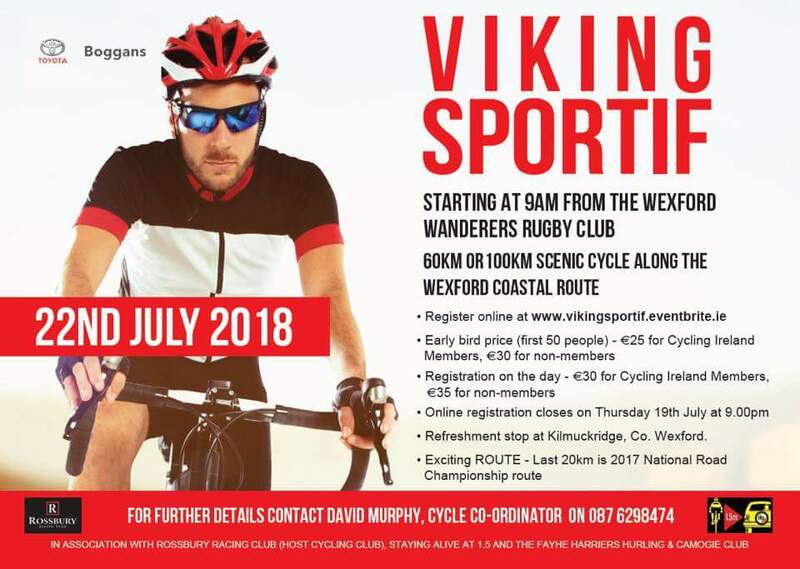 If you fancy taking on a sportive this Sunday, the Viking Sportif take’s place in Wexford Town. There is a choice of between a 60km or 100km distance’s with the last 20km taking the same route as last year’s National Road Championship. So keep something left in the legs for that! You can also sign on for the sportive on the day.